To print out, highlight the page's text and select "Print" on your web browser. Marthina Okeke’s journey into unpaid servitude (human trafficking and slavery) in New York City started in 1988 when a very prominent and wealthy local Chief (male) in her village (Arondizuogu, Imo State) in remote area of eastern Nigeria allegedly proposed getting her a US visa to go to America and do baby-sitting job (4 children) for his relatives for a fee of $300.00 a month. A jobless, un-educated, poor widow struggling-in-vain with 2 of her own little children; that was an offer Marthina Okeke could not resist. The wealthy Chief (a traditional and community leader) allegedly prepared the real and fake documents with which Marthina Okeke (a/k/a, Stella Marthina Okereke) secured the US traveling visa. Shortly after that, a Madam who is a relative of the wealthy and prominent Chief allegedly arrived from New York, repeated the offer (Marthina’s job which was to care for her 4 children and her wages which was $300.00 a month), including other promises and took her to United States of America. But upon arrival in New York City in 1988, Marthina Okeke was allegedly made to baby-seat 8 children (5 biological, 3 foster), cleaned inside and outside of 4 bedroom mansion, cooked and cleaned for her traffickers/captors for 12 consecutive years, was not paid and none of the promises made to her in Nigeria was kept. Her captors allegedly seized her documents and did not renew her visa, allowing it to expire. 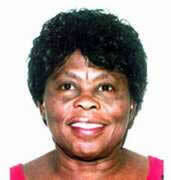 Marthina Okeke (a/k/a, Stella Marthina Okereke) eventually left her captors in 2000, sought refuge in a local church and from there she ended up in the household of another immigrant family from her village (Arondizuogu), also living in New York City. 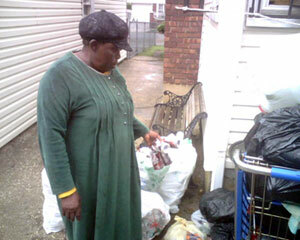 Marthina Okeke, 74 yrs old, packing bottles she picks from trash bins on the streets of New York City, USA. 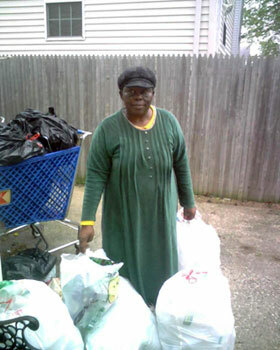 Marthina Okeke survived by picking empty cans and bottles from the garbage/trash cans and bins on the streets of New York; as well as doing babysitting for other Nigerian immigrants in New York and getting paid meager token amount. Marthina Okeke (a/k/a, Stella Marthina Okereke) story is well known within the Nigerian community, especially the Arondizuogu community in New York, New Jersey and other parts of United States, but no one stepped-in to help her due to fear of very powerful, influential and well-connected Nigerian family that lured, trafficked and enslaved her. The Nigerian family that lured, trafficked and enslaved Marthina Okeke (a/k/a, Stella Marthina Okereke) was reported to be very powerful, very influential and well-connected in high and low places, and that explains the main reason no one dared to step in to her aide. In July 2005, while in search for adjustment of her immigration status, a fellow Nigerian, freelance journalist who pleaded that she does not want to be identified for fear of her safety and life led Marthina Okeke to Africans In America, Inc. (AIA), a nonprofit organization raising awareness on issues affecting African immigrants in United States. Through intensive case management, advocacy and referral to pro-bono legal services groups, the Department of Health and Human Services certified her as a victim of trafficking and the U.S. Department of Homeland Security granted her a T visa in August 2006. Certified victims granted T visa enjoy the protection of US law, and that removes fear of deportation. Certified victims granted T visa also get some social benefits, and freedom to seek monetary compensation from their traffickers and captors. Recently (July 2009) US Immigration Services granted her Permanent Resident status which will enable her to travel out and return to United States. Now that her immigration status has been fully adjusted, Marthina Okeke wants to return to her home village (Arondizuogu, Imo State, Nigeria) for the first time since 1988. This is in preparation to finally going back home to settle. She has no money to make this possible, therefore, she is seeking support. By Mail: checks, money orders, bank draft, cashiers’ checks, etc. By Electronic Money Transfers from financial institutions such as banks, Western Union, MoneyGram, etc. By Online Credit Card through secure PayPal. By End-products and Assets donations through courier, trucking services and pick-ups. We are compiling list of donors and amount. All amount collected will be public (published on our website). Please indicate whether you want your name made public or not. © 2003 Africans in America, Inc.